Dave Inman (top, center) manned the auger on Monday morning at Fitch’s Pond near Springville, joined by his wife, Gail (right), and neighbor Clinton Severcool of Lake Carey. Making the drive from the Wyoming Valley to Susquehanna County for a day of ice fishing on Monday were (above, from left) Dave Mariucci, Dominick Paterniani, and Dave Nerozzi. When extreme cold weather brings most activities to a halt, winter recreationists get all fired up. Not only have overnight lows been ideal for making snow at Elk Mountain, the arctic blast made for perfect conditions for ice fishing across Susquehanna County. 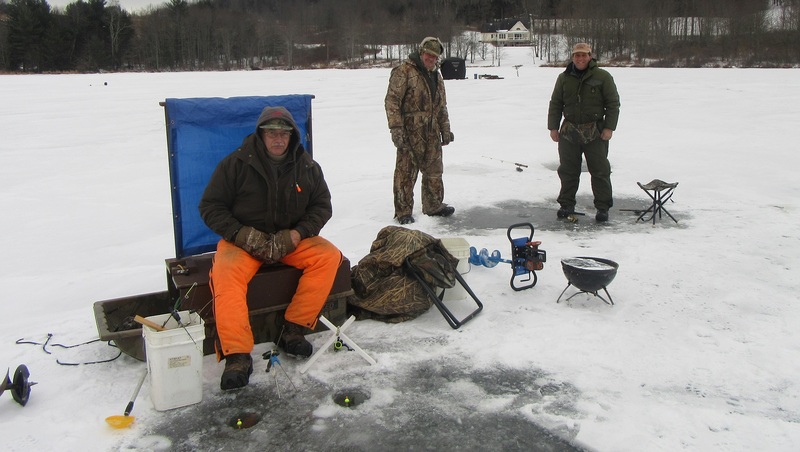 Many lakes and ponds have been dotted as of late with small shelters, campfires and anglers hunched over holes in the ice. Those who take part in the time-honored cold-weather activity couldn’t be happier. “It’s a good time to catch the pan fish, which are very good eating, and it gives you a good sport in the winter,” says Kern Dibble of South Auburn, who has been ice fishing for the better part of his 70 years. He got started with his father, Kern Dibble and grandfather, Raymond Dibble on Nick’s Swamp and Carlin’s Pond, both near Auburn Center. Closer to Springville, six anglers were gathered on Fitch’s Pond off Hunter Road on Monday morning to try their luck. One group included Dave and Gail Inman and Clinton Severcool from Lake Carey, and the other Dave Mariucci, Dominick Paterniani, and Dave Nerozzi from West Wyoming and Plains. While each group had a different approach to the sport, all were hoping to pull in their share of perch, blue gills and calicos for the frying pan. Dave Inman and Clinton credit neighbors in Wyoming County for introducing them to ice fishing, and Gail had her first experience while on an early date with her now husband, Dave, in 2002. Her naivety of the sport and the extreme conditions almost cost her a few toes. “We were out with a bunch of his buddies, and I didn’t want to tell them that my feet were cold,” Gail recalls. “When she got home, started crying and said, ‘My feet are so cold they hurt’ and started drawing a tub of hot water,” Dave Inman added. One look at Gail’s feet revealed just how close her toes were to being frozen. He had her soak them in luke warm water until the natural color returned. Gail enjoyed ice fishing however and was able to persuade her husband to purchase a tent and heater to keep her involved. She now wears insulated boots and layered attire. Frostbite is just one potential danger to winter angling, the other being accidental submersion. The crew from Plains prefers fishing on ponds to taking their chances on river shelves or even large lakes due to the relative stability of the ice. Dave Nerozzi thinks those who risk ice fishing on river ice are crazy. Gail related that she and her husband fished from the shelf at Skinners Eddy in Laceyville a few years ago, and she reeled in a sizable channel cat, much to the dismay of her male counterparts who caught nothing that day. Whether or not the fishing is good, both groups agreed that the ice is the strongest that it has been in several years. “My husband bought me a new jigger for Christmas last year, and I didn’t get to use it,” Gail remarked. “We only got out a few times last year,” Dave Inman agreed. He was busy drilling numerous holes with his auger in a large circle and setting tippits – stationary devices with flags attached to the baited lines about four feet below – at each opening. A group of tippits springing in succession generally indicates a good fishing spot, and the crew moves their seats and shelters there to do some jigging – dropping in a baited line from a small, hand-held pole. “Once we locate them, everybody moves in on them,” said Clinton. The members of the Plains gang are newer to the sport, having started together just over a decade ago. They graduated from the same high school and hunted together for many years, and ice fishing was simply a new activity to adopt. They’ve had good days at Fitch’s Pon before and were excited to be back. Their strategy is to drill three holes in close proximity and set up jiggers on props, sitting nearby with watchful eyes on bobbers. They also like to stay close to their coolers and grill so they can enjoy some wine and venison steaks.